Description of Service. 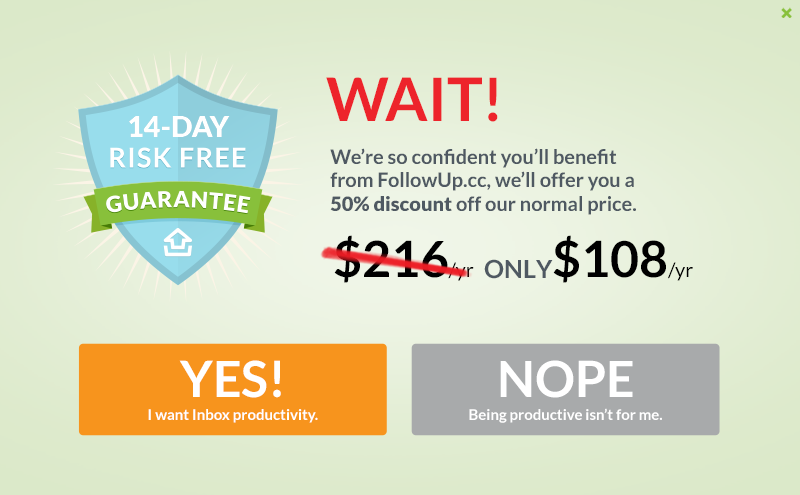 FollowUp is a email reminder service (the "Service"). You understand and agree that the Service is provided on an AS IS and AS AVAILABLE basis. FollowUp disclaims all responsibility and liability for the availability, timeliness, security or reliability of the Service. FollowUp also reserves the right to modify, suspend or discontinue the Service with or without notice at any time and without any liability to you. Personal Use. Due to the Children's Online Privacy Protection Act of 1998 (which is available at http://www.ftc.gov/ogc/coppa1.htm), you must be at least thirteen (13) years of age to use this Service. You must provide current, accurate identification, contact, and other information that may be required as part of the registration process and/or continued use of the Service. You are responsible for maintaining the confidentiality of your Service password and account, and are responsible for all activities that occur thereunder. FollowUp reserves the right to refuse service to anyone at any time without notice for any reason. Proper Use. You agree that you are responsible for your own communications and for any consequences thereof. 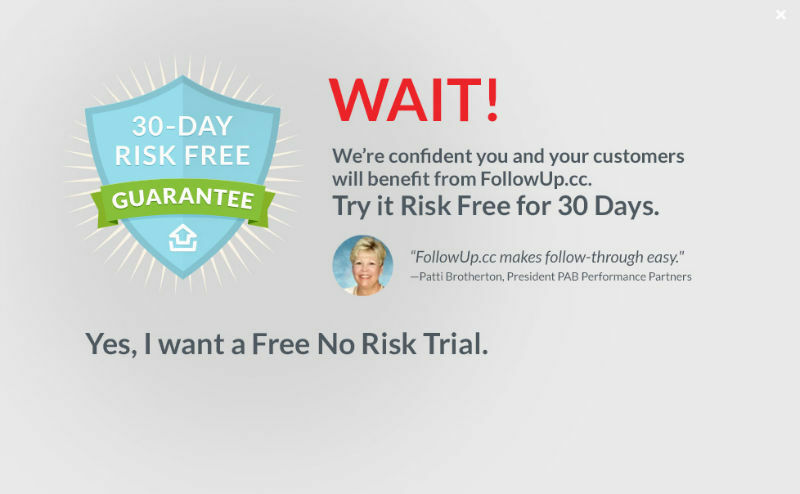 Your use of the Service is subject to your acceptance of and compliance with the Agreement, including the FollowUp Program Policies ("Program Policies"), located at https://followup.cc/pages/privacy, or such other URL as FollowUp may provide from time to time. You agree that you will use the Service in compliance with all applicable local, state, national, and international laws, rules and regulations, including any laws regarding the transmission of technical data exported from your country of residence. You shall not, shall not agree to, and shall not authorize or encourage any third party to: (i) use the Service to upload, transmit or otherwise distribute any content that is unlawful, defamatory, harassing, abusive, fraudulent, obscene, contains viruses, or is otherwise objectionable as reasonably determined by FollowUp; (ii) upload, transmit or otherwise distribute content that infringes upon another party's intellectual property rights or other proprietary, contractual or fiduciary rights or obligations; (iii) prevent others from using the Service; or (iv) use the Service for any fraudulent or inappropriate purpose. Violation of any of the foregoing may result in immediate termination of this Agreement, and may subject you to state and federal penalties and other legal consequences. FollowUp reserves the right, but shall have no obligation, to investigate your use of the Service in order to determine whether a violation of the Agreement has occurred or to comply with any applicable law, regulation, legal process or governmental request. Content of the Service. FollowUp takes no responsibility for third party content (including, without limitation, any viruses or other disabling features), nor does FollowUp have any obligation to monitor such third party content. FollowUp reserves the right at all times to remove or refuse to distribute any content on the Service, such as content which violates the terms of this Agreement. FollowUp also reserves the right to access, read, preserve, and disclose any information as it reasonably believes is necessary to (a) satisfy any applicable law, regulation, legal process or governmental request, (b) enforce this Agreement, including investigation of potential violations hereof, (c) detect, prevent, or otherwise address fraud, security or technical issues, (d) respond to user support requests, or (e) protect the rights, property or safety of FollowUp, its users and the public. FollowUp will not be responsible or liable for the exercise or non-exercise of its rights under this Agreement. Intellectual Property Rights. FollowUp's Intellectual Property Rights. You acknowledge that FollowUp owns all right, title and interest in and to the Service, including without limitation all intellectual property rights (the "FollowUp Rights"), and such FollowUp Rights are protected by international intellectual property laws. Accordingly, you agree that you will not copy, reproduce, alter, modify, or create derivative works from the Service. You also agree that you will not use any robot, spider, other automated device, or manual process to monitor or copy any content from the Service. The FollowUp Rights include rights to (i) the Service developed and provided by FollowUp; and (ii) all software associated with the Service. Your Intellectual Property Rights. FollowUp does not claim any ownership in any of the content that you upload, transmit or store in your FollowUp account. We will not use any of your content for any purpose except to provide you with the Service. Representations and Warranties. You represent and warrant that (a) all of the information provided by you to FollowUp to participate in the Services is correct and current; and (b) you have all necessary right, power and authority to enter into this Agreement and to perform the acts required of you hereunder. Account Inactivity. After a period of inactivity, whereby a user fails to login to an account for a period of nine months, FollowUp reserves the right to disable or terminate the account. If an account has been deactivated for inactivity, the username associated with that account may be given to another user without notice to you or such other party. Termination; Cancellation. You may cancel your use of the Services and/or terminate this Agreement with or without cause at any time by going to the Billing page; provided, however, that a terminated account may continue to exist for up to two business days before such cancellation takes effect. FollowUp may at any time and for any reason terminate the Services, terminate this Agreement, or suspend or terminate your account. In the event of termination, your account will be disabled and you may not be granted access to your account or any files or other content contained in your account although residual copies of information may remain in our system. Except as set forth above or unless FollowUp has previously canceled or terminated your use of the Services (in which case subsequent notice by FollowUp shall not be required), FollowUp will notify you via email of any such termination or cancellation, which shall be effective immediately upon FollowUp's delivery of such notice. Sections 3, 4, 5, 7, and 9 - 11 of the Agreement shall survive expiration or termination. Indemnification. You agree to hold harmless and indemnify FollowUp, and its subsidiaries, affiliates, officers, agents, and employees from and against any third party claim arising from or in any way related to your use of the Service, including any liability or expense arising from all claims, losses, damages (actual and consequential), suits, judgments, litigation costs and attorneys' fees, of every kind and nature. In such a case, FollowUp will provide you with written notice of such claim, suit or action. Google Apps is a registered trademark of Google. We are not affiliated with Google or Gmail, but we're good friends. This feature is only available to FollowUp.cc users on certain paid plans. Upgrade to start using your Calendar. Your Calendar is a great way to view and manage all your past & present reminders at a glance. Upgrade to a Pro plan to enable phone support. Try a FollowUp.cc Team Plan FREE for 14 days! 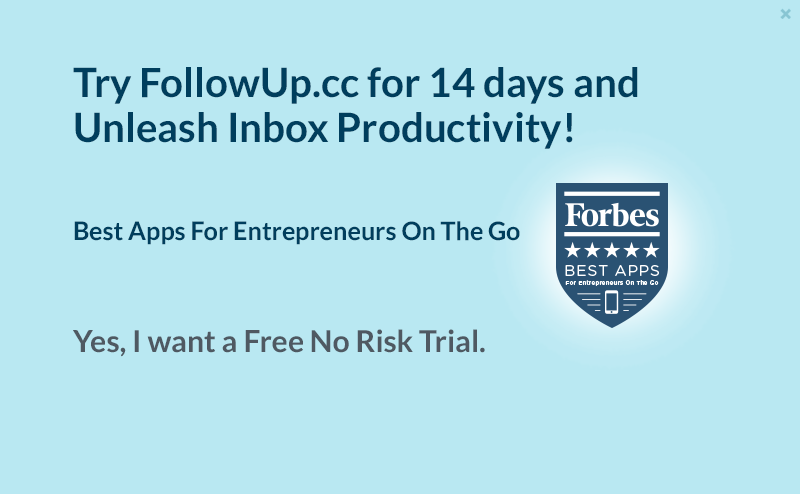 "FollowUp.cc is an essential tool for keeping on top of email and tasks. My team has started using FollowUp.cc - they all rave about it. It is a life-saver!" Please call us at 855-467-0420 to securely cancel your account. Thank you. You're switching to the plan. Confirm below! The number of emails you have on your account is more than the number allowed on the plan you're switching too. Note that deleting emails below will also delete all related reminders associated with this email address. Please select email addresses you'd like to remove below. Get 2014 pricing while it is still available. Prices are going up in the new year! No thanks. I'll wait for prices to go up.